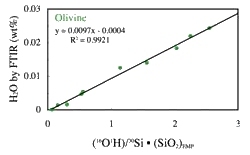 Spectroscopic methods remain the most important and convenient way to establish the presence of hydrous components in minerals and to differentiate water from hydroxide ions. They are sensitive, rapidly applied, and convenient to conduct, but are not intrinsically self-calibrating. To address the problem of quantitative calibration, we are developing independent, absolute calibrations for the spectroscopic methods. When the concentrations of OH in minerals are over a few percent (expressed as H2O), the independent analysis of the hydrogen content can be reliably conducted by a variety of methods. Hydrogrossular can be found in nature with a variety of different H2O contents and can be synthesized with essentially every atom of Si replaced by four H+ ions. A calibration of the IR spectrum of OH in grossular can be readily assembled from a combination of natural and synthetic samples. It is not certain that this calibration is rigorously accurate when the OH in garnet is present in substitutional mechanisms other than the hydrogarnet substitution. Thus, other methods of calibration must be developed. Absolute hydrogen manometry involves extraction of the hydrogen from a sample under high vacuum and temperatures and collection and separation of the evolved gasses. The hydrogen-bearing component converted to molecular hydrogen and measured in gas manometer. This method is widely used in isotopic studies, but is not always suitable for calibration of the infrared studies of 'nominally anhydrous' minerals. The primary challenges come from the fact that most minerals of interest contain either fluid inclusions or cracks and cleavages decorated with fine-grained hydrous minerals. Consequently, only inclusion-free portions of samples can be used for analysis of the low concentrations found in the 'nominally anhydrous' minerals. Furthermore, sizable quantities (grams) of such high-quality material is usually required for these analyses. In spite of these difficulties, a selections of minerals have been successfully analyzed by this method and form the basis of some of our absolute calibrations. Recently, we have collaborated with Professor John Eiler and his student, Julie O'Leary, who developed a new and more highly sensitive method for hydrogen manometry that allows much smaller samples to be analyzed that can be done by the conventional methods of such analysis. We have enjoyed a long-term collaboration with the research group of Prof. Freidel Rauch at the University of Frankfurt, Germany, who conducts nuclear reaction analyses for the determination of hydrogen. The nuclear methods, while not routine, provide absolute calibrations that are the basis of a variety of mineral-specific calibrations. Rauch's group made much progress in bringing these methods into the realm of quantitative at the 10 ppm and higher level. Calibrations of for garnet, olivine, pyroxenes, kyanite, zircon, and other minerals have emerged from \this method for samples with 10's to 100's of ppm H2O. Researcher Jed Mosenfelder used the Caltech Cameca 7f-GEO SIMS instrument to establish SIMS calilbration standards for olivines, pyroxenes, garnets and glasses using a variety of standards previously calibrated by nuclear reaction analysis and absolute hydrogen manometry. Initial results, to date, are encouraging. Former postdoc Eugen Libowitzky, now at the Institut für Mineralogie und Kristallographie , University of Vienna, Austria, examined the intensity of the OH bands in minerals in systems with different degrees of hydrogen bonding. Previously, trends relating the intensity of OH absorption to the length of the O···H–O bond were noted in the study of the spectra of chemical compounds. Libowitzky studied minerals with extremely short hydrogen bonds (such as pectolite and mozartite) and established that similar quantitative trends are observed in the spectra of minerals containing stoichiometric amounts of OH. When trends such this can be established for a group or class of minerals, they allow infrared spectroscopy to be used for absolute H determination in minerals without the necessity of the mineral-specific calibrations discussed above. Much of our current effort is directed at addressing the apparent deviation of the calibrations for minerals with low levels of OH from the general calibration trends obtained with minerals with high concentrations of hydrogen. These are common mineral phases that often show wide variation in the details of their infrared spectra. A variety of factors influence the accuracy of infrared spectroscopic measurements. One of the more important is the quality of the polarizers used to examine anisotropic solids. We have examined the effect of the polarizers and have shown that poor polarization efficiency is the most obvious potential source of large error in the quantitative measurement of a spectrum of an anisotropic crystalline solid.